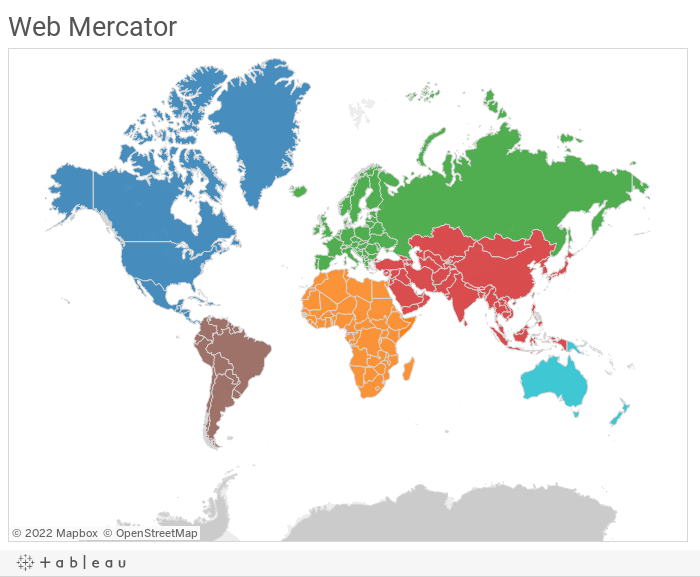 When you create a map in Tableau, by default you're creating a map in the Web Mercator projection. 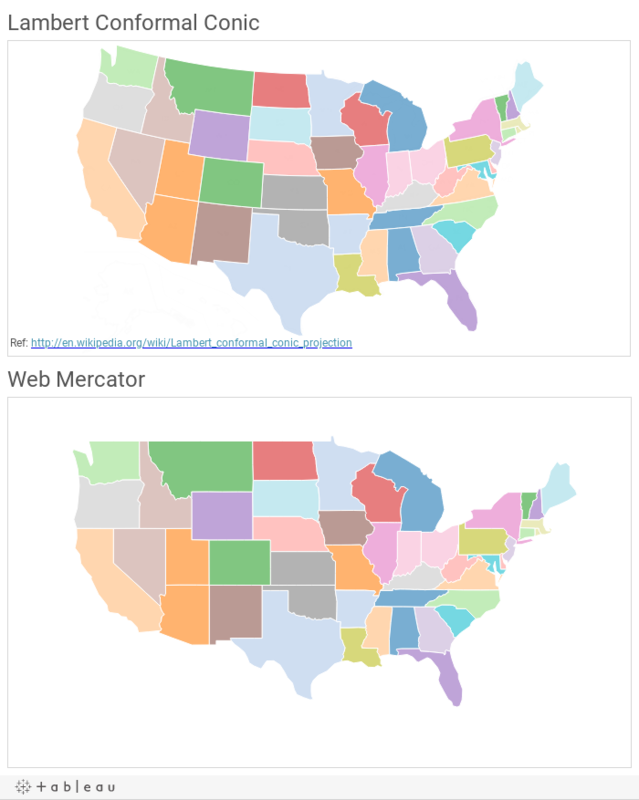 At present, Web Mercator is "the de facto standard for web mapping applications", and is used by popular content providers like Google Maps, Microsoft Bing Maps, and OpenStreetMaps (which we use), among others. Every map projection is a distortion of the truth, because it involves smashing an ellipsoid (the earth) onto a plane (the map). Something's gotta give. Map projections all have their respective pros and cons. One distinct advantage of the Web Mercator is that all parallels (latitude) are, well, parallel, and so are the meridians (longitude), meaning that you can zoom in on an intersection in Finland and the streets will still cross at right angles. Would it surprise you to find out that Greenland (836 K sq-mi) is less than one eighth of the surface area of South America (6.89 M sq-mi)? Web Mercator greatly exaggerates area near the poles. So what if each country's physical surface area really mattered to your story, like if you were visualizing population density or natural resources? How could you show an alternate projection for your world map with less area distortion? There's currently no setting to switch to a different projection, but with a little work, you can always make one yourself using the Polygon Marks type. First, get the Shapefiles for countries from the Natural Earth Data 1:110m Cultural Vectors. Here is link to download the zip file. Next, convert the Shapefile .zip to a CSV using the Alteryx Tableau Shapefile to Polygon Converter (requires a free log in). Here is the CSV for the country shapes. Then, connect Tableau to this new CSV and create two calculated fields R_LAT (for Robinson Latitude) and R_LON (for Robinson Longitude) using the equations in this Word document. Make sure these two fields have no geographic role assigned (right click on each calculated field > Geographic Role > None). I added finishing touches to this dashboard by adding Continent to the Color shelf, formatting the Tooltips, and adding the Sheet to a Dashboard along with Text objects linking to an information page and the source shapefiles. Coloring by Continent isn't all that interesting, but you could follow Andrew Cheung's #MappingMonth tutorial to blend your own data and color by population density or natural resources, etc. 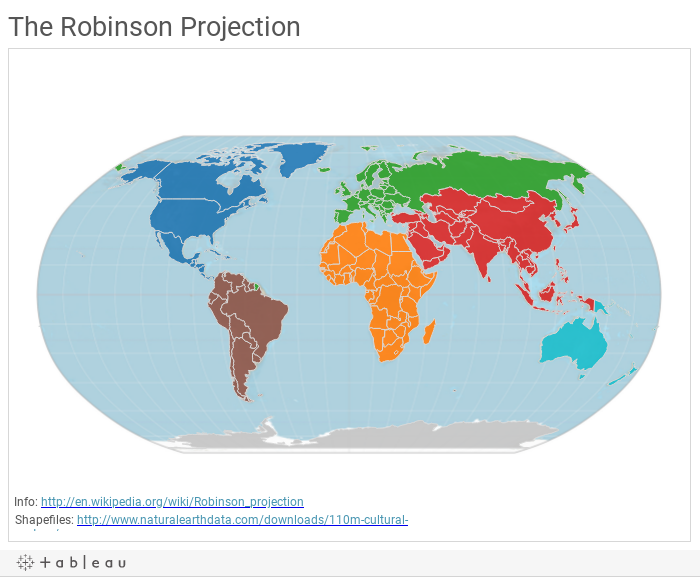 How to Make the Lambert conformal conic projection of the U.S.
To create this map projection, the steps are very similar to the Robinson world map above, except the latitude and longitude transformations were done in Excel. The Ohio State Geology department provides a very useful Excel spreadsheet that allows users to convert latitude and longitude to x and y coordinates of the Lambert projection. I took this spreadsheet and modified it to accommodate batch conversion of a list of lat/long pairings. The batch conversion spreadsheet is included in Step 2 below. First, get the Shapefiles for states of the US from the Natural Earth Data 1:110m Cultural Vectors. Here is link to download the zip file. Next, convert the Shapefile .zip to a CSV using the Alteryx Tableau Shapefile to Polygon Converter (requires a free log in). Here is the CSV for the state shapes. Then, use the Lambert conversion spreadsheet to generate x and y coordinates for the state polygons, and copy and paste the E and N columns into your original CSV. To make sure the aspect ratio of the map was correct, I added a background image of the Lambert projection and matched the borders with my map, setting Washout to 100% once I was comfortable with the match. With a little research and some fancy coordinate transformations, you can use Tableau to draw alternate map projections. I hope this tutorial helped you understand how to create these two alternate map projections, and I hope you also walk away with the sense that you could create a different projection using these same tools and techniques. Thank you! Just tried this for the first time in my viz - worked a treat. Focussing on Africa and developing nations really shows the weakness of Mercator. Now it's so nice to see Greenland disappear to its rightful size! Look through your pile again and seperate the items into two more piles. Hello there, just became alert to your blog through Google, and found that it is really informative. I am going to watch out for brussels. I抣l appreciate if you continue this in future. Many people will be benefited from your writing. Cheers!